Construction of new transmission lines and substations by Wheatland Electric Cooperative will allow the delivery of more reliable power to southern Kansas homes and businesses. POWER Engineers (POWER) is providing Wheatland Electric the engineering design and other services to seamlessly coordinate work on two transmission and four substation projects needed to significantly improve system reliability. The work at Wheatland Electric is being done in conjunction with major transmission upgrades by Mid-Kansas Electric Company in the same area and includes new 138-kilovolt (kV) lines in the areas of Caldwell and Conway Springs. It also includes construction of new substations at Caldwell, Conway Springs, and Rago. A fourth substation at Bluff City will get upgrades to accommodate the new 138-kV line. “The new 138-kV lines will provide a much more reliable source than the existing lines and will better support present and future power demands,” says Brian Tomlinson, POWER’s project manager for the work at Wheatland Electric. “The new lines, along with Mid-Kansas transmission additions, will give local distribution substations two paths to deliver electricity, providing Wheatland Electric more flexibility for restoring power during an outage, such as during a storm, thereby improving reliability.” The higher voltage lines also allow industry to consider building in areas that previously could not support their needs for electricity. Besides engineering design, POWER’s services for the projects include support for procuring materials, putting together construction contracts, issuing construction documents to contractors, evaluating bids, recommending contract awards, holding pre-construction meetings, and more. The majority of the power projects are expected to be completed by the end of 2017. POWER Engineers is a global consulting engineering firm specializing in the delivery of integrated solutions for energy, food and beverage facilities, communications, environmental, and federal markets. POWER Engineers offers complete multidisciplinary engineering and program management services. Founded in 1976, it is an employee-owned company with more than 2,100 employees and over 45 offices throughout the United States and abroad. Fixing flaws introduced during the machining of large components used in the aircraft and heavy equipment industries can be time-consuming for manufacturers and costly if they must scrap the flawed parts after they’ve been fabricated. A new approach developed by researchers at Missouri University of Science and Technology is helping manufacturers eliminate those flaws before the parts are created. Writing in the February 2017 issue of the Journal of Manufacturing Science and Engineering (JSME), the Missouri S&T researchers describe an approach that can greatly improve the accuracy of five-axis machine tools used to fabricate large parts. Five-axis machine tools are computer-numerically controlled (CNC) machines that can move, cut, or mill a part on five different axes at the same time. This allows manufacturers to create complex contours or curves when creating a large part such as an aircraft wing. “Five-axis machine tools are known to have 41 basic geometric errors,” says Jennifer Creamer, a Ph.D. student in mechanical engineering at Missouri S&T and the lead author of the JMSE paper. As Dr. Robert Landers, professor of mechanical and aerospace engineering and a co-author of the paper, puts it, “The way you want the machine to move when making a large part is different than the way it actually moves due to inherent geometric errors.” Because of these errors, manufacturers must make adjustments in calibrating their CNC machines. Several different approaches exist to help compensate for those errors, but none of them provides a complete picture, Creamer says. Manufacturers must combine various methods to get the best sense of a milling problem. The result, she says, is “a piecemeal approach that makes calibration a time-consuming and expensive process." In her research, Creamer set out to find a way to eliminate that piecemeal approach and develop a new model for capturing complicated geometric errors while also automatically generating compensation tables for those errors. A compensation table is a kind of map of errors that can be programmed into a CNC machine to reduce errors. Flaws in the fabrication of large parts may seem insignificant given the large size of the parts, but they can cause problems. Parts for airplanes, for example, can be 120 feet long, and their size can make holding tight tolerances problematic, Landers says. In Creamer’s research on five-axis machine tools, “She’s trying to hold errors to five thousandths of an inch over 120 feet,” he says. In collaboration with colleagues at Boeing Research and Technology in St. Louis, where she works as an engineer, Creamer used a laser tracker to quickly measure the motion of all axes over the entire workspace of an industrial five-axis machine. 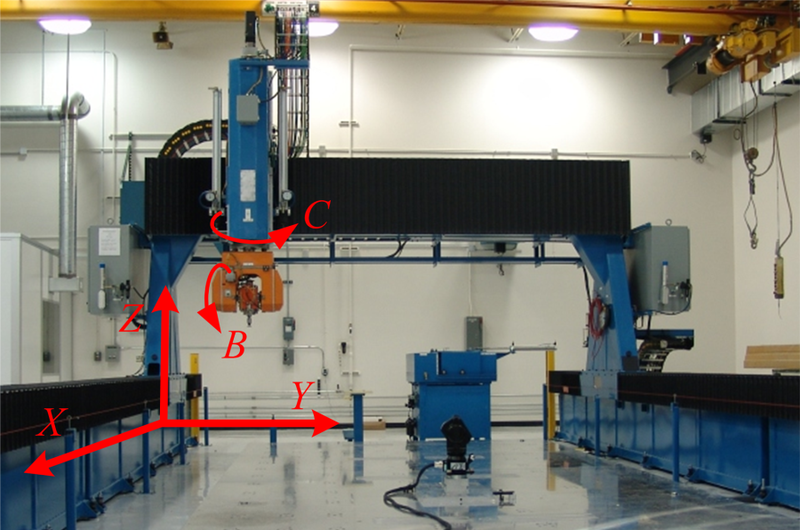 Based on these measurements, she generated a set of compensating tables that could be used to improve the accuracy on a variety of machine tools and related platforms. 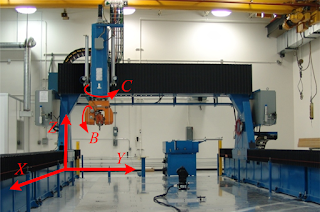 Creamer’s paper, titled “Table-Based Volumetric Error Compensation of Large Five-Axis Machine Tools," was originally published online in September 2016 (https://manufacturingscience.asmedigitalcollection.asme.org/article.aspx?articleID=2543543). Co-authors with Creamer are Landers; Dr. Patrick Sammons, who earned his Ph.D. from Missouri S&T in 2016 and is now a postdoctoral researcher at the University of Michigan; Dr. Douglas Bristow, associate professor of mechanical and aerospace engineering at Missouri S&T; Dr. Philip Freeman, senior technical fellow at Boeing; and Samuel Easley, an engineer at Boeing. The research is supported by Missouri S&T, the Boeing Company, and Missouri S&T’s Center for Aerospace Manufacturing Technologies. Creamer is also supported through a GAANN Fellowship at Missouri S&T. GAANN (Graduate Assistance in Areas of National Need) is a U.S. Department of Education program designed to encourage more graduate-level education in areas of national need. Thornton Tomasetti, an international engineering firm, has acquired Swallow Acoustic Consultants Limited (SACL), a specialist in acoustics, noise, and vibration control engineering based in Mississauga, Ontario, Canada. The addition of Swallow bolsters Thornton Tomasetti's Structural Engineering and Forensics practices as well as its Canadian presence. Founded in the early 1990s by John Swallow, SACL offers a broad range of services in acoustics design and forensics and noise and vibration analysis and control. These include architectural acoustics; environmental, industrial and mechanical noise control; acoustic and vibration testing; expert witness testimony; technical writing and standards; construction vibration assessment; and vibration control. In addition to its Mississauga headquarters, the 13-person firm has an office in Ottawa, Ontario, Canada. John Swallow will become a principal at Thornton Tomasetti, while Ramin Behboudi and Michael Wesolowsky will join as associate principals. SACL is one of a small number of firms worldwide that designs tuned mass dampers (TMD), a device used to help stabilize buildings against wind sway and other kinds of motion. Its TMD work includes tall buildings and long-span structures such as sports facilities and bridges. SACL's TMD capabilities will dovetail with Thornton Tomasetti's efforts in the field, which includes the development of a fluid harmonic disruptor based on NASA technology. Starting with Manhattan's LaGuardia School for the Arts in 1988, Thornton Tomasetti has collaborated on many projects with SACL as well as strategic partner Tacet Engineering, whose staff SACL acquired in 2012. These include Chifley Tower in Sydney, Australia; Soldier Field in Chicago, Illinois; Qatar National Convention Centre in Doha; and most recently, T-Mobile Arena in Las Vegas, Nevada, which opened last April. SACL has worked in some 20 countries and has a considerable presence in central and eastern Canada. This will give Thornton Tomasetti a larger footprint in Canada, having opened its first office in the country in Toronto earlier this year. According to Thomas Scarangello, chairman and CEO of Thornton Tomasetti, "For nearly 30 years, Swallow has been our go-to partner for vibration issues. Through our close collaboration on many diverse projects, we have built a strong working relationship." John Swallow, president and founder of Swallow Acoustic Consultants, adds, "Teaming with Thornton Tomasetti will allow us to serve current and future clients in new and innovative ways. We look forward to sharing our considerable experience in the acoustics, noise, and vibration control fields with Thornton Tomasetti's professionals." Thornton Tomasetti is involved in engineering design, investigation, and analysis, serving clients worldwide on projects of all sizes and complexity. Through its 10 complementary practices, Thornton Tomasetti addresses the full life cycle of a structure. They have supported clients working in more than 50 countries, with projects that include the tallest buildings and longest spans to the restoration of prized historic properties. Thornton Tomasetti consists of more than 1,200 engineering, architecture, sustainability, and support professionals that collaborate from offices across North America, Asia-Pacific, Europe, Latin America, and the Middle East.